You may also require new flooring if you're building an addition, remodeling a room or repairing a damaged part of your house. In all these instances, Trademark Contractors can help you select the type and style of flooring that fits your project requirements. We offer flooring installation and hardwood floor refinishing in Buford, Atlanta, Lawrenceville and throughout Georgia. Contact us today for an estimate! Wood floor refinishing: One of the main advantages with solid wood flooring is its ability to be refinished. When the floor finish or the flooring becomes worn, we can sand the floor surface smooth, then refinish the floor so that it looks like new again, even changing the color of the stain. Carpeting: Wall-to-wall carpeting will always be a popular flooring choice because it provides a comfortable, quiet, long-wearing floor that can be installed directly over plywood sub-flooring. While not suitable for moist, high-traffic areas like kitchens, bathrooms, and entry foyers, carpeting is an excellent option for bedrooms and upstairs hallways. When it comes to your flooring, you want to make sure the job is done correctly no matter what material you're installing. At Trademark Contractors, we help you choose the best flooring material for your home and handle the installation process from start to finish. We also have the expertise to take care of all your wood floor sanding and refinishing needs. 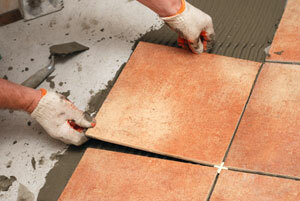 If you want to upgrade the flooring in your home, call the local experts at Trademark Contractors today. Whether you're working on a home remodeling project or simply want to update your floors, we have the quality products and materials to give you a beautiful, long-lasting floor. We offer free estimates on all our work in Lawrenceville, Buford, Atlanta, Suwanee, Dacula, Gainesville, Duluth, Roswell, Alpharetta, Braselton and nearby, so call us today get started!